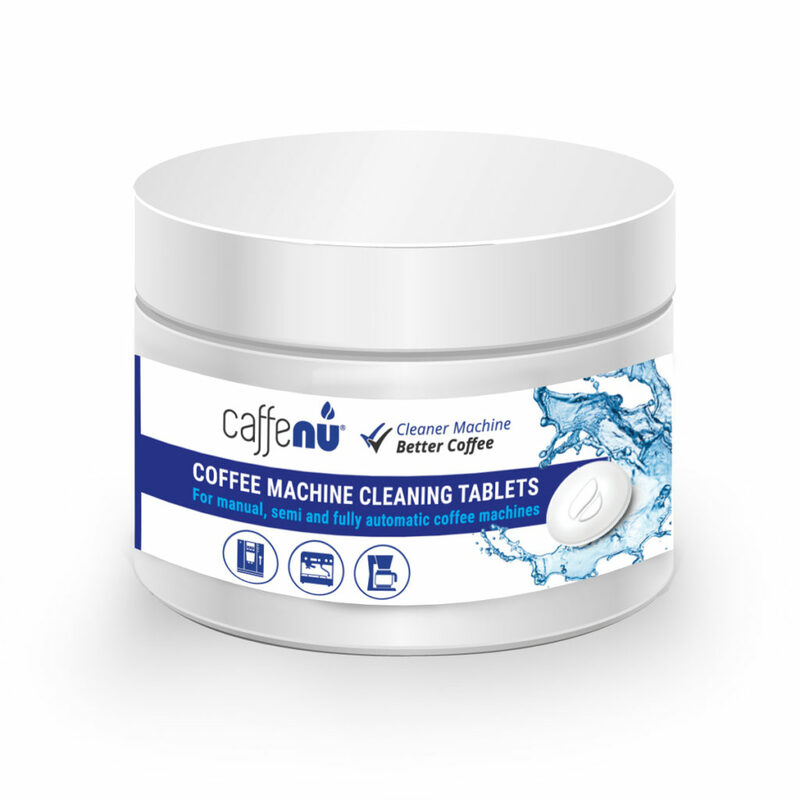 The Caffenu® cleaning tablet removes dirty coffee oils, odours and bitter tannins that collect inside brewing units, pots and filters. 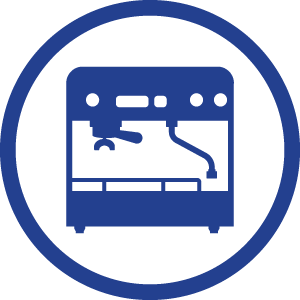 With its powerful degreasing agent, it cleans coffee appliances like no water or descaler solution can. Regular cleaning increases the life span of your machine and contributes to a perfect coffee taste. Important: Follow cleaning instructions as per your respective manufacturer’s user manual. Storage: Store in a cool, dry area and away from foodstuffs. Follow cleaning instructions as per your respective manufacturer’s user manual. Remove brewing unit out of the machine and rinse thoroughly under running water. Remove remaining grounds, ensure coffee machine is clean and free of coffee. Drip tray and used coffee basket must be empty. Reinsert the rinsed brewing unit. Place a large cup underneath the coffee spout. Put one Caffenu® cleaning tablet into the coffee grounds chute. 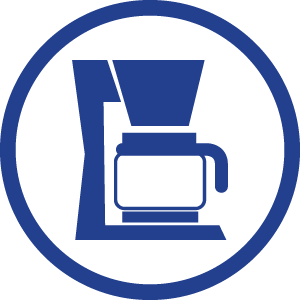 Press/select the coffee pre-grounds button and select for one cup of coffee (or follow normal procedure for making one cup of coffee from pre-grounds to start the coffee extraction). When programme is half way through cycle, interrupt by turning the appliance off using the main switch. Let appliance stand for about 5 minutes to allow the solution to take effect. Empty cup. Switch the appliance on again. Carry out Step 4 to rinse, at least three times or until the water in the cup is clear. Do not add anything to pre-ground chute while carrying out rinsing procedure. Remove brewing unit out of the machine and rinse thoroughly under running water. To clean the drip tray and the used coffee basket, either soak it in the cleaning solution from your cup or alternatively place another tablet inside it and fill it up 2/3rds with hot water. Allow the cleaning solution to sit for 5 minutes, then rinse drip tray and used coffee basket thoroughly. Put one Caffenu® cleaning tablet in a small coffee cup and fill the cup with hot water. Let the solution sit for 2 minutes. Remove brewing unit out of the machine and rinse thoroughly under running water. Remove remaining grounds, ensure coffee machine is clean and free of coffee. Drip tray and used coffee basket must be empty. 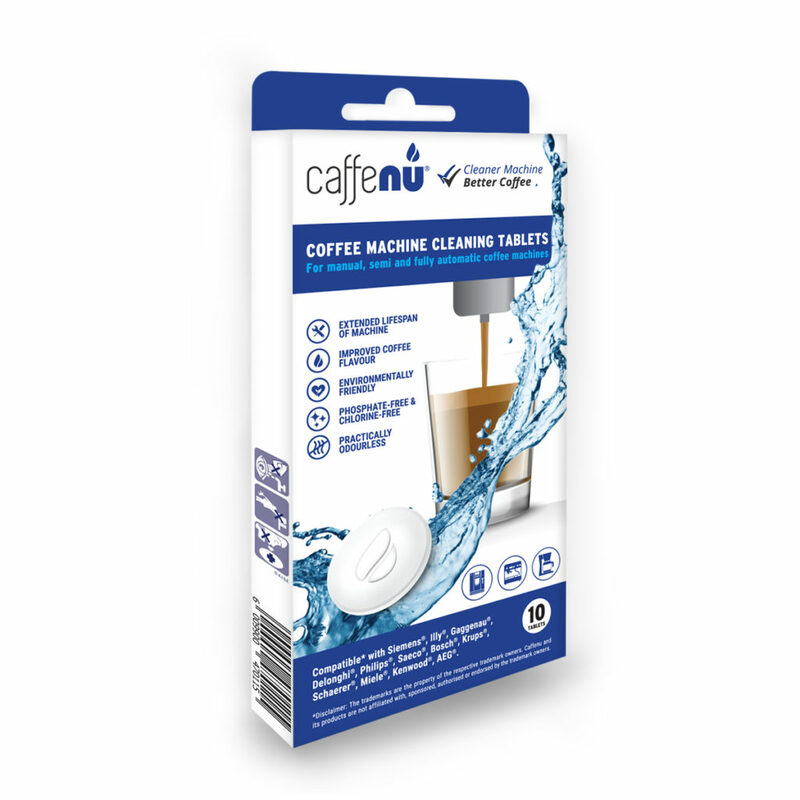 Use the prepared Caffenu® cleaning solution to thoroughly clean the filters, brewing shaft and brewing head as well as the outlet dispensing pipe. A small brush or sponge may be used to aid cleaning. Let the solution sit for a few minutes, then rinse thoroughly with hot water, and dry off. Reinsert the dry brewing unit into the machine. To achieve the perfect coffee taste, immediately pour away the first cup of coffee. Turn on machine and fill the water tank of the machine with fresh water. Place the Caffenu® cleaning tablet inside the filter in the coffee handle. Clamp the portafilter/coffee handle into the coffee machine. 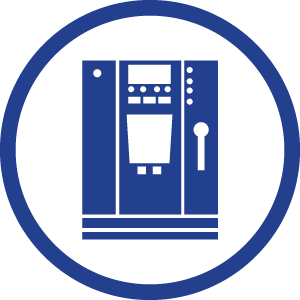 Place a large coffee cup underneath the coffee spout and press the appropriate button to dispense coffee. Stop machine and wait approximately 1 to 2 minutes. Remove portafilter/coffee handle and clean coffee head and seal using brush or cloth. Replace portafilter/coffee handle. Then repeat Step 4 with large cup until the water from the machine runs clear. In order to achieve the perfect coffee taste, immediately pour away the first cup of coffee. Dissolve 2 Caffenu® cleaning tablets per 1 litre of boiling water in a suitable container. Place objects to clean in solution for about 20 minutes, until parts are clean. Rinse thoroughly afterwards with fresh water. Fill the water tank of the machine with fresh water. Place a Caffenu® cleaning tablet in the filter holder/funnel (do not insert the paper filter). Switch the machine on to let water run through the funnel, where the tablet will be dissolved, and the solution will run into the jug. Before all the water has run through, remove the jug to stop the flow. The solution needs to remain in the funnel for 2 minutes. Replace the jug to activate the flow again and let the remaining solution run through. Empty the jug and rinse thoroughly. Put a Caffenu® cleaning tablet inside the thermos flasks or inside the coffee pot, fill it up 2/3rds with hot water and let it sit for about 5 minutes to allow the solution to take effect. Then rinse thoroughly with hot water.